The architecture of any country is a marker of its culture, history and tradition. The materials used, the shape, the lines, curves and colours all come together to present a masterpiece that is unique and beautiful. Vietnamese architecture is no different. From vernacular stilt houses to extravagant palaces and concrete towers, the country's building is an ode to its rich past and its promising future. Traditional houses in Vietnam were characterized by wooden structures topped by steep roofs. The roofs would be covered with fish-scale tiles and curve outwards, while beams and rafters held up the main building. In some places, stilt houses were built and the houses usually had an odd number of rooms. However, the coming of various dynasties shaped cultural landmarks in the country in different ways. Palaces, pagodas and citadels flourished in Vietnam for over 500 years. The Ly Dynasty of the 11th century, for example, was deeply influenced by Buddhism and incorporated intricate reliefs and motifs into their architecture. In 1031, a staggering 950 pagodas were constructed by the reigning monarch Ly Thai Tong. During this period, rounded statues, door-steps, decorated roofs and bannisters were common features of Vietnamese architecture. The Imperial Citadel of Thang Long, a UNESCO world heritage site now, is a must-visit for tourists looking to experience Vietnamese heritage up close. Located in present-day Hanoi, the citadel was the political centre of the region for 13 centuries consecutively and will delight history buffs in particular. 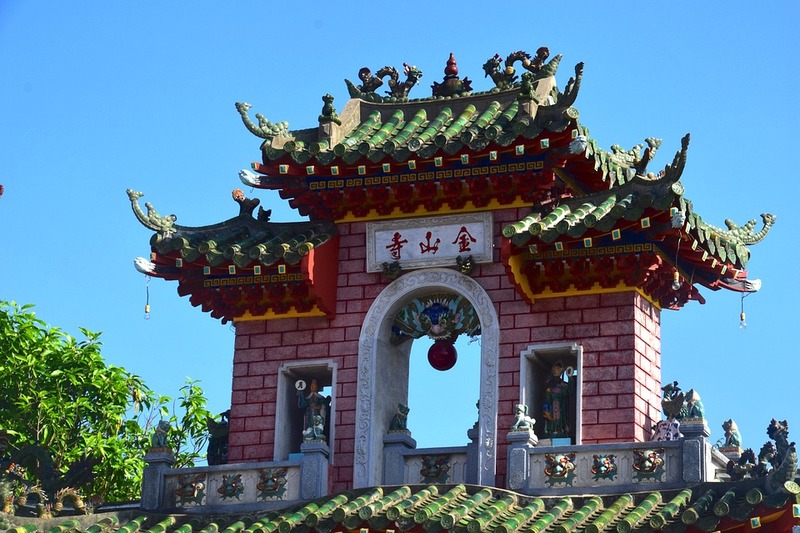 This magnificent structure is a fine example of Vietnamese architecture from the medieval era. Tran dynasty, which gained a foothold in the 13th century, brought its own set of beliefs and customs that made its mark in Vietnam's architectural history. Buildings became more complex and demarcated, and gardens became a part of temples and places of worship. Tower-temples also emerged at this time; The Pho Binh Tower in Nam Dinh province and Binh Son Tower in Vinh Phuc province are relics from the Tran dynasty. The Le Dynasty thrived in the 16th and 17th centuries, and witnessed the rise of folk art and sculpture being used in contemporary carvings and paintings. The Tay Phuong Pagoda and Bang Communal House are the most remarkable buildings of this era. The last major Kingdom was the Nguyen dynasty, which shifted the capital from Thang Long to Hue in central Vietnam. Although it retained the older tradition of wooden houses, the structures built during this period appear to be slender and lighter. These are also decorated with flowers, dragons and phoenix motifs, and have multiple layers within the roofs. This is what gives the lighter appearance, and the roofs would have up to 8 layers with the space between them (known as co-diem) filled with porcelain and ceramic bits. The French left their mark all over Vietnam, architecturally speaking, as they colonised the country for almost 70 years. 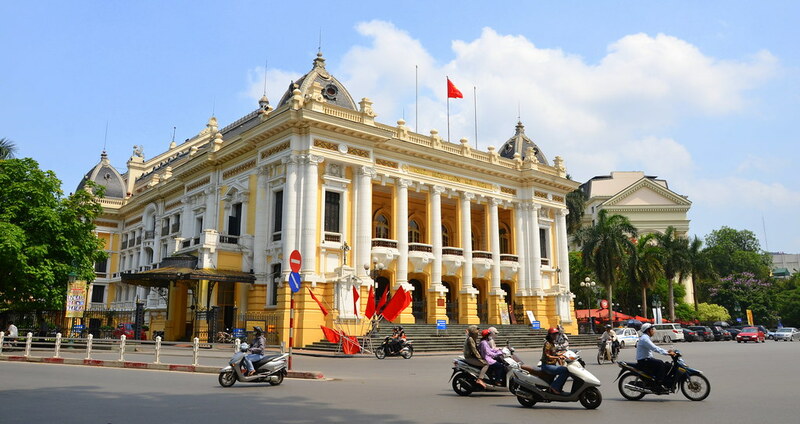 The influence of French styles in Vietnamese architecture is especially prominent in Hanoi and Hoi An, where many landmark buildings that have now become the most popular tourist attractions of Vietnam. St. Joseph's Cathedral in Hanoi, serving four million Catholics was modelled after the Notre Dame in Paris and continues to attract people with its neo-gothic edifice. Another reimagining of a French icon is the Hanoi Opera House - inspired by the Palais Garnier- painted in vibrant yellow and white hues. With Italian-made marble floor, copper chandeliers and murals on the ceiling, the Opera House is as famous for its beautiful interiors as it is for the musical performances held there. Other noteworthy structures in Vietnam displaying colonial French architecture include The Presidential Palace and The National Museum of Vietnamese History. You might notice that these buildings are all yellow, a colour that is not only uplifting but also reflects the heat of the tropical country. The style that took the world by storm in the 20th century found a place in Vietnam too. The period between the 1940s and the 1970s is known as the golden age of modernist architecture in Vietnam by historians. In Ho Chi Minh City especially, several remarkable buildings were designed by Vietnamese architects in the modern style such as the Reunification Palace and the University of Architecture. Skyscrapers, however, such as the Bitexco Financial Tower were designed by foreign companies, which explains why they are more easily identifiable as international modern structures; since materials such as glass, metal and concrete dominated. With such a rich history carved into its walls, Vietnamese architecture fascinates the millions of travellers who come looking to absorb its beauty. Not only do the country's buildings prove to be a visual delight, they're also imbued with the culture of Vietnam - a fact that only adds to their allure. The information is here is all you need to get started on your Asian getaway. Just make sure you don't forget to take your camera along!